Maltese have been popular dog breed choices for centuries, and most are loving, affectionate, gentle animals who are eager to please their owners. Like all small dogs, however, Maltese are also prone to hyperactivity, nervous barking and defensive biting. Proper training, begun as early as possible and continued on a consistent basis, is essential for avoiding or curbing these problem behaviors. The Maltese is a breed that bonds closely with their owners and requires almost constant attention. If left alone for long periods of time, Maltese may become destructive and develop a nervous chewing or barking habit. 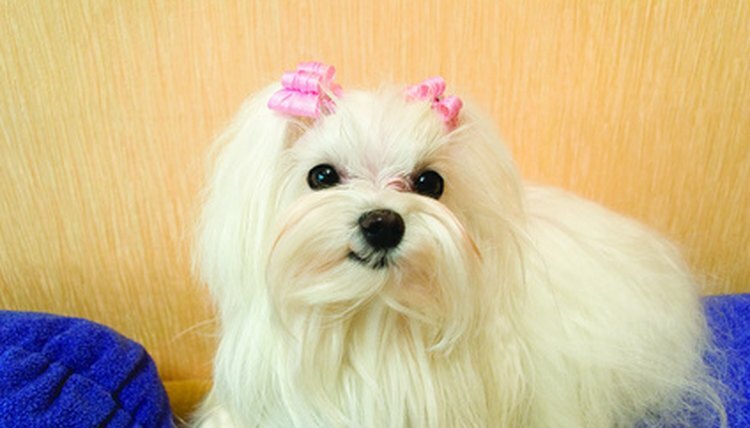 Anxiety can also translate into hyperactivity, causing a Maltese to react as a way of gaining their owner’s attention. All puppies bite when they are teething, and nipping is common Maltese puppy behavior when playing with their owners. If not taught to do otherwise, adult Maltese will bite when they feel nervous, anxious or when threatened or approached by strangers. Many adult Maltese are fearful, anxious and inclined toward hyperactivity, nervous biting and barking because they are used to being coddled and spoiled by their owners. When forced to look out for themselves, they resort to these behaviors out of fear. The kindest thing a Maltese owner can do is to resist the temptation to carry her dog constantly instead of letting him walk and forgo normal obedience and leash training. When taught to behave like a normal dog, a Maltese will do so. Because of their separation anxiety issues, it is important that a Maltese not be left alone for long periods of time. When you must leave them, you can make the separation easier by accustoming them to be away from you for shorter periods of time in advance. Biting should be discouraged immediately each time it happens, even if it just a “playful” nip. If you're not sure how to train your Maltese, enroll him in a local obedience class. Because of their small size and temperament, Maltese are not considered to be good pets for children under 10. Never leave a young child and a dog unsupervised.